Enjoy this gardening favorite's vibrant blooms from late spring through fall when you follow these tips for proper care. Prized for their prolific blooms in a rainbow of colors—from creamy white and soft pink to shades of deep rose and crimson red—begonias are favorites of home gardeners everywhere. Make neighbors jealous with the addition of your own this season. This complete guide will help you identify the perfect plant and outline the necessary begonia care to help it thrive in your garden or container. With more than 1,200 known species, the Begoniaceae family is one of the largest flowering plant groups. Even so, it’s relatively simple to identify begonias because all of its species fall into three main types, sorted by their root systems. Tuberous begonias, which are grown from potato-like tubers, make popular bedding plants (or first-choice options for the flower bed) due to the fast growth of their showy blooms that last from early summer to late fall. They range in height from a few inches to over a foot, and they produce single or double blooms—some reaching up to 6 inches in diameter, depending on the species. Known better for striking foliage than blooms (although some species are flowering), rhizomatous begonias are characterized by roots resembling knobby, horizontal stems that creep along the surface of the soil. The leaves on this type of begonia can be quite colorful, ranging from near-white and soft yellow to deep purple, green, and red, often in exotic combinations and patterns. The roots of a fibrous begonia look like your typical plant roots that extend downward into the soil. These attractive flowering plants also come in a wide variety of colors for use as bedding plants or container plants. If you’re looking for blooms to plant in (shaded) window boxes and hanging baskets, select a species of fibrous begonias that develops long, soft canes; these bamboo-like stems will spill over the edge in a showy burst of color. With the exception of one or two species, begonias are tropical or subtropical plants and can be grown as perennials (dying back in fall and regrowing in spring) in zones 9 and 10 of the USDA Plant Hardiness Zone Map. In most of the U.S., however, begonias are treated as annuals (planted for a single growing season) or indoor specimen plants. They prefer daily temperatures around 75 degrees Fahrenheit and overnight lows in the mid-60s, but they can often tolerate higher temperatures with protection from harsh sun rays. Begonias can be transplanted to the flower garden in late spring as soon as the danger of frost has passed; they will thrive—even bloom, depending on the variety—from then until fall when overnight lows dip below freezing. While begonias can’t tolerate hours of direct sunlight, these plants bloom in a combination of partial shade and soft light. The best location for this compromise is on the north or east side of your home, beneath a large tree or covered patio to filter the sunlight. In more densely shaded spots, flowering tuberous and fibrous begonias tend to develop more leaves than blooms, though Rhizomatous begonias (which are grown for their foliage) will flourish. Ideal begonia care requires well-drained soil that has been amended by the addition of organic matter, such as compost and peat moss. While they enjoy humid conditions, they don’t like “wet feet;” soggy soil can cause their roots to rot. 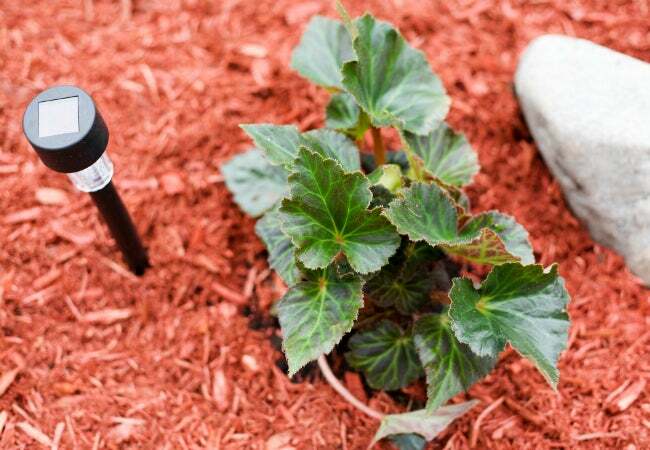 In dry weather, supplement Mother Nature’s begonia care with a rejuvenating fine mist via the sprinkler for 15 minutes in the heat of the afternoon and sufficient bottom watering—remember, just enough to keep the soil lightly damp but not waterlogged. For healthy plants and abundant blooms, apply 10-10-10 liquid fertilizer diluted at a ratio of three parts water to one part fertilizer when you first plant (or transplant) your begonias and approximately every three weeks thereafter. Begonias respond better to fertilizer solutions poured around their base rather than sprayed directly on the plant; the tender leaves and stems of some species can be injured by direct contact with strong fertilizer sprays. 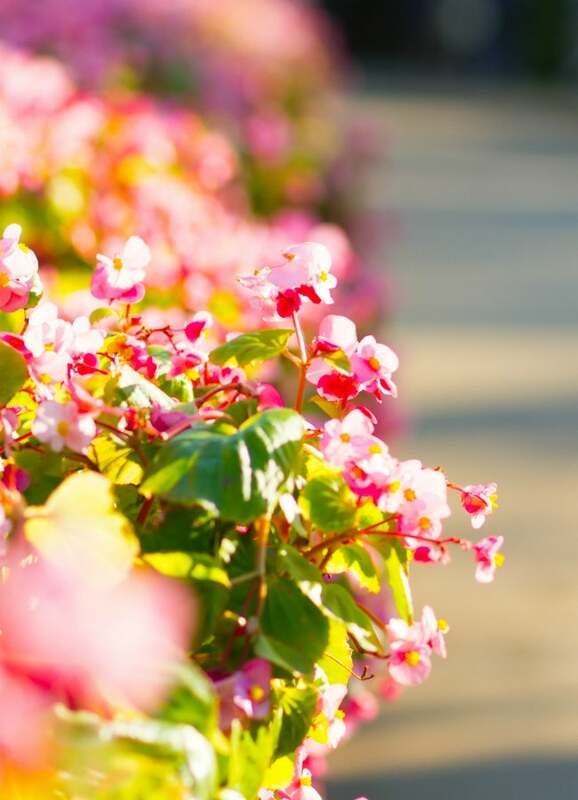 When filling out your flower bed, you can either purchase blooming begonias from any garden center in late spring or grow these bedding plants from seeds, rhizomes, tubers, or roots. If you choose the latter method, start them indoors in late winter so that they have time to mature before you transplant outside in warm weather. This begonia care practice, known as “forcing blooms,” will ensure that your begonias begin flowering just as soon as you plant them in the garden. Fibrous begonias are the easiest of the three begonia types to start from cuttings, but you may also have success taking cuttings from some other types of begonias. Take a few stem cuttings about 4 inches long each from your favorite plant, dip each in rooting hormone, and plant them in moist peat moss. Once they develop roots, they can be overwintered (as described below) for replanting in your garden again next summer. Whether from the nursery or started indoors, young begonias are ready for planting in the garden any time after the risk of frost has passed. Prepare the soil by tilling it well to break up any clods before planting. Water the young begonias frequently for the first two weeks to keep the soil slightly moist, but avoid letting them stand in water. Species of rhizomatous and fibrous begonias are among the easiest to overwinter, since both types can be dug up and brought indoors to overwinter as houseplants. They require a spot near a window where they receive filtered light during the winter months. Many overwintered begonias are susceptible to fungus problems—which is rarely an issue outdoors, thanks to breezes that help circulate air through their leaves—so it’s a good idea to spray the plants with a broad-spectrum fungicide when you bring them indoors. 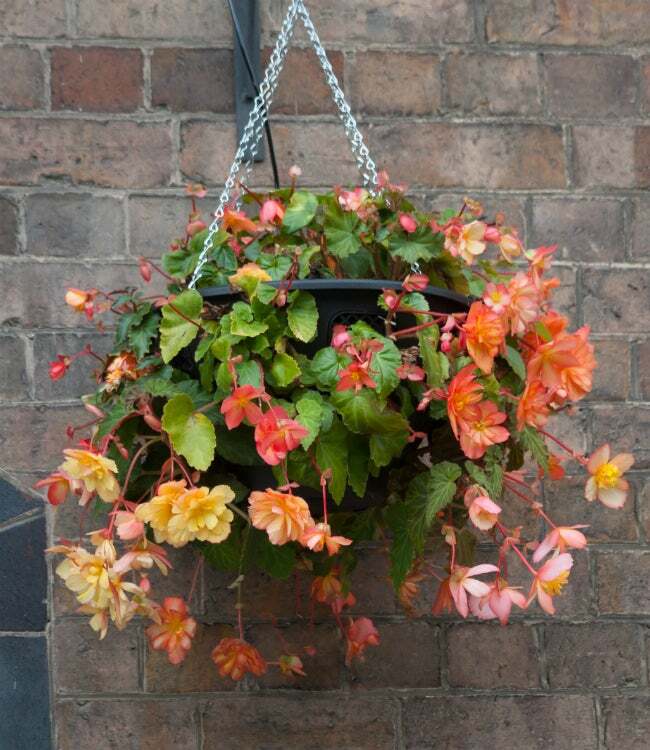 Keep the soil of overwintering begonias damp but not saturated, and water them from the bottom to keep their leaves dry. Tuberous begonias, on the other hand, can be difficult to overwinter, because the tubers can rot or die if they get too warm or too cold, or if they develop fungus—don’t feel bad if yours don’t survive indoors for the season. 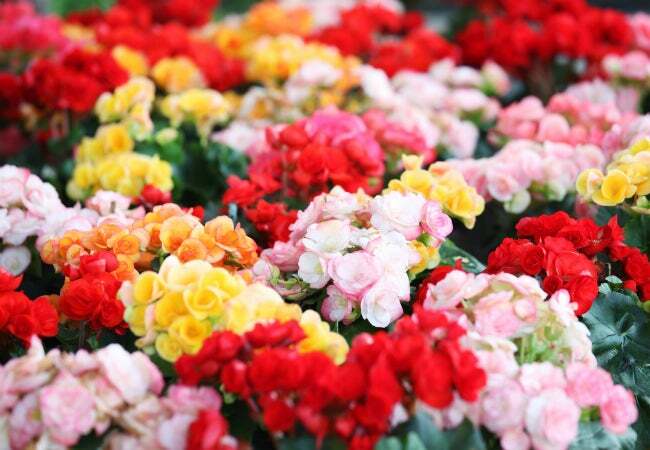 Most tuberous begonias naturally go dormant during late fall months, and they need this downtime to rest. For the best chance at saving the tubers in your garden, transplant them into pots and bring them indoors before frost. Keep the soil only slightly moist and, when the stems die back, allow the soil to dry out. Remove the dormant tuber from the soil and treat it with a garden fungicide powder before storing it in a dry indoor location between 55 and 65 degrees warm until late winter. Replant the tuber as described above to force blooms in time for spring.